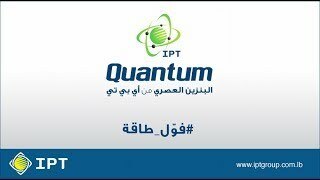 As one of the top products in the Lebanese market, "Quantum" has built over the past year a reputation of efficiency and trust. Compliant with the highest Lebanese and International standards, the success of "Quantum" in the Lebanese market was due to the need for a superior fuel product that meets the demands of the 21st century. The formula of "Quantum" is a mix of high-quality gasoline and a cutting-edge additive developed by Total, a specialized company in this field. "Quantum" is not only eco-friendly; it is also known for its engine protection function, optimized performance, and reduced fuel consumption. "Quantum" also offers exceptional deposit clean up, better combustion, less noise, and an improved driving experience. Quantum is exclusively available at all IPT stations at no extra cost. Check page, download brochure, and watch TVC to know more.